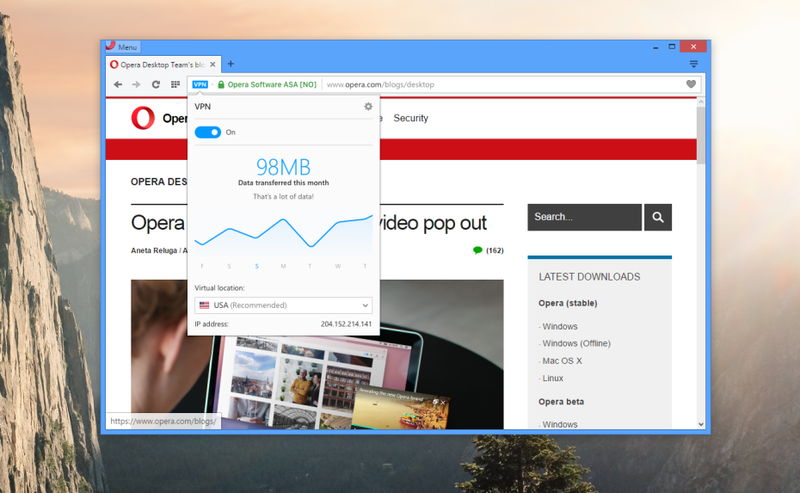 Recently, Opera announced a free built-in VPN service for its upcoming browser release. So, users will be able to enjoy free VPN to hide their identity while browsing the web. Opera VPN is powered by SurfEasy. But you do not need to download or install anything in the browser. It comes as a browser feature. Just update your Opera browser and start using this free VPN service. In this article, I will tell you How to use Opera VPN. Before you start reading how to use Opera VPN, you should know about VPN. If you already know about VPN, you can skip this part. VPN or Virtual Private Network is the group of computers networks together over The Internet. Businesses use VPN to connect their computers and data centers which are not on the same LAN to access data and resources. This method helps in getting secure and encrypted communication over the public network or The Internet. All your communication over The Internet is secured from eavesdropping. VPN client is one computer which connects to a VPN server to access data or resources. VPN are not just for business but individual users can also use this to access the internet anonymously. Almost all websites track user activities, ISP monitor internet usage and restrict bandwidth based on your browsing activities, websites save your location and OP address and many more examples are there for tracking a user online. By using VPN service, an Internet user can avoid tracking. A VPN prevents user tracking and stops websites spying on you by hiding your data and IP address. Step 1: Download latest Opera developer build and install in your system. It is available for Windows and Mac. Step 2: Now go to the settings page and enable the VPN option in the privacy and security section. By default this option is disable. Step 3: Now, open any website and you will see a VPN icon in the address bar. Click on this icon to manually select the country to get the random IP of that country. As this is the developer preview, so only three countries: Canada, Germany and United States are there. In the final stable release, Opera will add more countries. Select any country to get the random IP address of these countries and enjoy anonymous browsing. I personally tried this and it is working great. I tried accessing few websites which are not available in my country. With this built-in VPN, I can now access those websites easily. This is the developer preview, so it may come with various bugs. If you are willing to try, download it and install on your system. If you want to avoid bugs, I recommend you to wait for the stable release. next stable release will come with this built-in VPN feature. After Opera Max and Ad-blocking, this is another nice feature of Opera browser. I am sure many people will switch browser to use Opera VPN. Try this feature and let us know your experience. Share your views with us via comments.